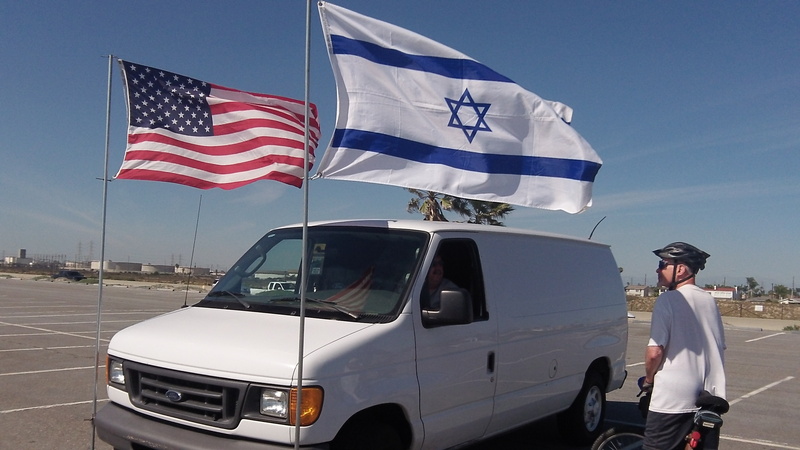 The owner of a van parked near a California beach last week makes a point with two flags. There have always been tensions between the Obama administration and the Israeli government headed by Benjamin Netanyahu. Now their disagreement about Iran and other issues is even more acute, and the question is who’s right and who’s wrong. The answer should not be hard. Obama is hoping that diplomacy and soothing talk can control and restrain the ayatollahs in charge of Iran in their apparent drive to develop nuclear weapons for the long-range rockets they already have. This week Obama broadcast an address to the Iranian people, sounding conciliatory. Netanyahu does not trust Iran to keep any agreement, and he fears that if economic sanctions are lifted, it will be only a matter of time before Iran becomes the biggest nuclear power in the Middle East. And once that happens, Netanyahu believes, it will be only a matter of time before his country is attacked with those weapons. So where does that leave the American public? Let’s consider who we’re dealing with. On the one hand, we have a little country on the eastern Mediterranean with a market economy that holds regular free elections, a country that America has supported ever since it was created after the Second World War. Israel has just re-elected a prime minister who knows first-hand of the dangers his country faces. Netanyahu served in his country’s army, led a unit of special forces in combat missions and was wounded more than once. He also lost a brother, killed in the raid on Entebbe when Israeli commandos rescued more than 100 Israeli hostages. You have stated the facts before us quite well. Obama’s background of being raised a Muslim certainly included anti-Jewish teaching which he has not been willing to overcome. which a rational, informed, capable, and balanced person will reject. I only question one assertion you make: “…it will be only a matter of time before Iran becomes the biggest nuclear power in the Middle East.” That’s based on what knowledge? I would suggest that the Israeli capability and endeavors in this realm will always outstrip Iran’s. Israel have also shown the willingness to take out nuclear facilities in the region by means of their superior technology. but at what cost, Ray? The USA is THE ONE nation that can solve this problem without running the risk of igniting a third world war. Obama clearly isn’t the man for the job. He’d rather play golf than grapple with the world’s escalating problems in any meaningful way. Obama wanted the title of POTUS, but clearly didn’t want the job. Einstein said: “I do not know with what weapons World War III will be fought, but World War IV will be fought with sticks and stones”. That ought to be plenty of food for thought as we consider the possibilities of the mess in the Middle East, of which Obama deserves MUCH of the blame. To put in perspective just how tiny Israel is, a young man from my church provided us a map with the nation of Israel superimposed on a map of Oregon. Israel is about 1/8 the size of our state! As an American taxpayer, I don’t want any of my tax monies to be sent to Israel, and for that matter, I don’t want them sent to any other foreign nation. If people want to voluntarily send their own money to foreign nations, please let them go ahead with my blessing. Certainly there are many Jews of great wealth in the U.S. who do this and that’s fine. I will even support a box to check on our tax returns designating aid to the country of your choice. It’s Israel’s job to take care of its own defense, not America’s, and as far as I can tell, they do it very well, although thankfully they haven’t yet unleashed their own (and the only country in the Middle East who has one), extensive nuclear arsenal. It was an error for America to support Israel with American tax money from 1948 and it’s an error now. It’s past high time we Americans learn to mind our own business. Instead we are destroying all the noble ideas upon which this country was founded. I believe that if Iran develops a nuclear weapon it will be only a matter of time before they use it. Their delivery systems (missiles) are approaching intercontinental in range, and if they develop the capability to deliver a weapon to our shores we will know how it feels to be threatened as Israel does today. We must NOT forget we also are the avowed enemy of those that run Iran. Obama is the weakest POTUS I’ve seen, certainly in my lifetime. He makes Jimmy Carter look like a war monger. I further believe he surrounds himself with women advisers and staff because he can’t deal with strong willed men that will say what he doesn’t want to hear and that extends to other world leaders with Netanyahu the prime example. He sent many of his top political hacks over to Israel to influence their election. Thankfully, evidence suggests that move backfired and helped lead to Netanyahu’s victory last Tuesday. If only we had such a strong and determined leader. Obama is no Netanyahu, of that we can be sure. continuously somewhere since 1989. Yet, we seem ever more insecure even when the lethality and precision of our weaponry and forces has never been greater. Just maybe our participation in armed conflict so often is actually counter productive. If that is not correct, then what level of conflict is necessary for us to realize the security we seek? Complete American military control of all countries in the Middle East and Africa until they agree to operate under the requirements we impose? Lastly, if you lived in other parts of the world and you see this ongoing list of conflict, why would you trust the United States?